What causes bronchiolitis in babies? What are the risk factors of a baby getting bronchiolitis? How common is bronchiolitis in babies? How does a baby catch bronchiolitis? What are the symptoms of bronchiolitis in babies? 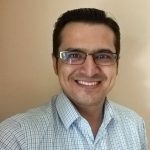 How to care for the baby at home? What are the complications of bronchiolitis? How to prevent bronchiolitis in babies? At first, it may seem like the common cold. But later, the symptoms make it clear that it’s worse than a cold or viral fever. Bronchiolitis causes a constant cough, congestion, and runny nose in babies. The infection also makes breathing difficult. While it may seem hard to differentiate the condition from cold and common viral fever, the symptoms of bronchiolitis are distinct and easily identifiable. So what causes bronchiolitis in babies? How can it be prevented? 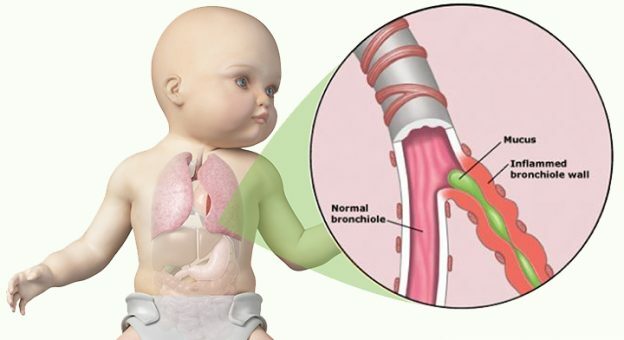 MomJunction gives you all the essential information you need about bronchiolitis in babies and toddlers. Bronchiolitis is a viral infection that leads to the swelling of bronchioles, which are tiny air tubes or passages inside the lungs (1). The air passages develop inflammation due to excessive formation of sticky mucus, which clogs the airways and makes it harder for the baby to breathe. Respiratory syncytial virus (RSV): It is responsible for almost 60-80% of bronchiolitis cases among infants and toddlers. Rhinovirus (RV): It is the second leading cause and responsible for 14-30% of bronchiolitis cases. Human bocavirus: It is the third leading cause and contributes to about 15% of cases. Human metapneumovirus: It is responsible for 3-12% of bronchiolitis cases. Influenza viruses, enterovirus, adenovirus, and coronavirus: These viruses together account for 1-8% of cases. The number of viruses causing this infection make it quite prevalent. About 20-30% of infants can be affected by viruses that cause bronchiolitis. Some experts state that about 50% of all infants get the infection at least once before their first birthday (3). It primarily affects babies below the age of two but is most common in infants between the ages of three and six months (4). 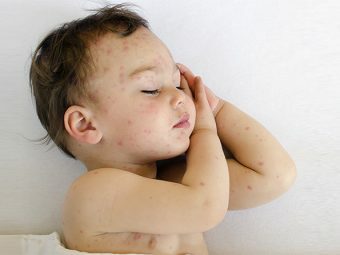 Babies get infected with the virus when they come into contact with other people, including kids and adults who have been infected by the virus. The bronchiolitis-causing viruses can thrive outside the body, on contaminated surfaces. Babies can get infected when they touch such surfaces and put their hands in the mouth. Bronchiolitis is quite common in babies and toddlers during winter and the early spring season, starting from December to until late March. What Are The Risks Of The Baby Getting Bronchiolitis? That said, the virus causing bronchiolitis can attack babies of all ages, especially when the weather is cold. Excessive coughing: The disease starts with a bad cough that could last a couple of days to a week. As the disease progresses, the coughing could get worse, and the baby may begin to get exhausted due to repeated coughing. A runny nose and chest congestion: A runny nose with phlegm that gets into the mouth while coughing, indicating lung congestion. Wheezing while breathing: By the second week of infection, the airways are severely swollen causing a wheezing sound during inhalation and exhalation. Chronic rapid breathing: The baby’s nostrils are flared, indicating rapid breathing, a condition called tachypnea. Fever: A body temperature of 102º F (38.8º C) or higher. 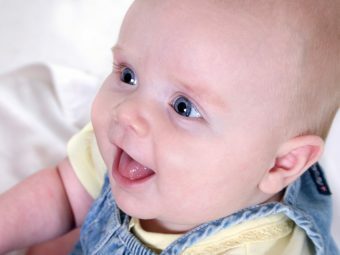 Colic and fussiness: The difficulty in breathing and fever will make the baby fussy and colicky. Symptoms of bronchiolitis often resemble symptoms of the common cold. However, as the disease progresses, you will notice other symptoms that make medical attention imperative. 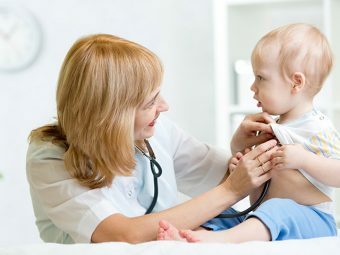 Check for wheezing: The doctor will use a stethoscope to listen to the characteristic wheezing sound, audible when a baby breathes. Chest X-ray: A chest X-ray can help reveal the constricted bronchioles inside the lungs. Measuring blood oxygen levels: Respiration in infants with severe bronchiolitis may be hampered with low blood oxygen levels. The doctor would attach a device called pulse oximeter to the baby’s fingers, to determine oxygen levels in the baby’s blood. Nasal mucus test: Mucus from the nose is collected using a cotton swab and then sent for laboratory analysis to determine the presence of the virus. Blood test: If other tests seem inconclusive, then the doctor may ask for a blood test, which measures the presence of antibodies in the blood to determine infection. Once the diagnosis is confirmed, the doctor will prescribe a course of treatment. How Is Bronchiolitis In Babies Treated? Bronchiolitis is a viral infection, which the body can clear on its own with antibodies. There is no specific treatment for the disease nor can it be cured with antibiotics that only work against bacteria (7). The doctor will prescribe medicines only to alleviate the symptoms. The baby may have to be hospitalized only in severe cases of illness. Medicines for fever: The doctor may prescribe medicines like acetaminophen (paracetamol) to bring down the fever and make the baby a little comfortable. Intravenous fluids: Babies with bronchiolitis have a hard time eating and drinking and may need intravenous fluids. This usually happens in severe cases of infection, when the baby has to be hospitalized for bronchiolitis. Oxygen through ventilator: A breathing ventilator can help the baby in respiration and improve oxygen levels in the blood. In most cases, the baby gets better without any treatment, with the symptoms improving within in a week (9). Just like any other viral infection, managing the illness at home is the best way to make the baby feel better and recover faster. Give plenty of fluids, especially breast milk that is rich in antibodies. Fluids help clear the mucus in the throat and are also easier to consume than solids. Babies with bronchiolitis can eat without any restrictions; make them have healthy food that boosts energy and immunity. Keep the baby away from smoke and dust. They can exacerbate bronchiolitis’ symptoms. Install a cool-mist humidifier. It increases the amount of humidity in the air and makes breathing easier. Do not use hot-mist or steam humidifiers as they increase the risk of burns in children (11). Use a bulb syringe to clear the nose. Frequent removal of mucus from the nose can make breathing easier. The bulb uses suction to draw the mucus out. Collect the mucus in a tissue paper and clean the bulb syringe with clean water. Keep the head elevated: Roll a blanket and place it under the crib mattress to raise it a bit from one end. It will help keep the head a bit elevated and make it easier for the baby to breathe. Do not place the pillow directly in the crib as it increases the risk of suffocation. If the symptoms exist for over a week, medical advice is essential. Bronchiolitis lasts for about two weeks and in severe cases, may take about a month to resolve. Proper home care and appropriate medications can help your baby feel better and prevent any complications. Pneumonia: The spread of the virus across the lungs can cause a widespread lung infection like pneumonia. Dehydration and malnutrition: Since the baby may have trouble eating and drinking, there is a risk of malnutrition and dehydration. Dehydration is a major concern since it can cause complication of its own. Apnea: It is an abnormal pause in breathing. Bronchiolitis can impair breathing and cause the baby to pause repeatedly, resulting in disturbed sleep and fatigue. Respiratory failure: Severely inflamed and clogged bronchioles can make inhaling and exhaling difficult, which can eventually cause respiratory failure. It is quite likely to happen in severe cases of bronchiolitis. Asthma: Babies with a severe case of wheezing due to bronchiolitis run the risk of developing asthma. Asthma could sustain even after the baby is cured. Complications are quite likely to manifest in high-risk babies, such as those with lung defects. Prevention is the best way to keep the baby at bay from the infection and the possible health complications. Maintain good hygiene: Wash your hands before handling the baby, cover your mouth while sneezing and wash your hands immediately after that. Ensure that the other members of the family and the caregivers of the baby also maintain hygiene. Avoid crowded places: Do not take babies to overcrowded places, where infections can spread quickly. If possible, choose a daycare with fewer infants. Keep baby’s items exclusive: Bronchiolitis-causing viruses are highly contagious and stay dormant up to 28 days on a contaminated surface. The virus can be unknowingly transmitted by sharing utensils or drinking cups. Always keep the baby’s utensils and other items separate and do not anyone else, including siblings, use them. Cover nose and mouth if you have a cold: Primary caretakers including parents must cover their nose and mouth if they have a cold. If you catch a cold, then breastfeed only after wearing a mask. Avoid kissing or cuddling with the baby till you are completely cured. Pre-medicate in case of high-risk infants: High-risk babies such as those born prematurely or with lung problems are given a preventive medicine named palivizumab. The medicine is not a vaccine but only a preventive that reduces the risk of infection due to RSV, which is the leading cause of bronchiolitis among infants (13) (14). Next, we address the commonly asked questions about bronchiolitis. 1. Can my baby have prednisone for bronchiolitis? Probably not. Prednisone is an anti-inflammatory compound that is often used to bring down the inflammation of bronchioles in bronchiolitis. However, the medicine has several side effects, most of which can be fatal for babies (15). A research study found that prednisone has no positive effect in improving the condition of babies with bronchiolitis (16). The medicine may be used by a doctor as a last resort and only in severe cases of bronchiolitis. 2. Can a baby have recurrent bronchiolitis? Probably, but it is most likely to happen in babies with compromised immunity or those with congenital disabilities in the lungs or the heart. 3. How do I differentiate between bronchiolitis and asthma? Babies with asthma are likely to display shortness of breath and wheezing when exposed to triggers like pollen, dust, etc. A baby with asthma may also not seem as unwell as a baby with bronchiolitis. However, asthma could develop as a complication of bronchiolitis. Therefore, diagnostic tests and response to treatment are the best ways to differentiate the two conditions from one another (17). 4. Can adults catch bronchiolitis from a baby? Yes. However, adults have stronger immunity and are most likely to display symptoms such as a cold and mild cough instead of the severe symptoms exhibited by the baby (18). Nevertheless, it is good to protect yourself from infection. Bronchiolitis is an ailment that can cause severe agony to the baby. However, most infants recover soon with no long-term effects of the condition. Home care with medication for alleviating the symptoms is all that you would need. Preventing bronchiolitis is easy through precautionary best practices. Have any tips on home care for bronchiolitis in babies? Do share your ideas in the comments section below. 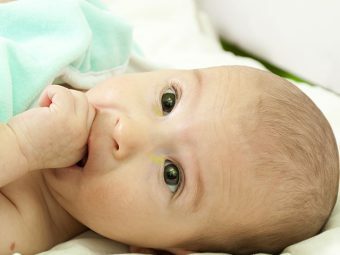 How To Bring Down A Fever In Babies?